I’ve come to the conclusion that people generally fall into one of two camps when it comes to following a recipe. There are those like my Jonny, that like to follow a recipe to the letter and find even minor substitutions (such as granulated sugar in lieu of caster) uncomfortable. Then there are people like me (surely I can’t be alone on this?) that find following a recipe to the letter nigh on impossible. Even if I happen to have all the ingredients in the cupboards, I just can’t help myself from pimping or adapting as I go. The positive flip side of this that my brain constantly concocts new recipes or mixes of ingredients, which probably makes being a food blogger my most perfect job in the world. So, all this waffle is to pre-empt my apology of the lack of actual ‘recipe’ in this ‘recipe’ for Watercress and Pine Nut Soup. I made it on Sunday morning, not long after Jonny had made me a Full English. The kitchen was a mess, my belly was full, but I wanted this soup made as Lizzy and Harrison were coming down, and we were off on a beach clean. I was feeling rebellious, and even though I planned to blog this soup, I didn’t measure one iota of what went in it. My bad. So, for all you ‘a type’ recipe devourers, please go and google for a proper recipe. However, for all my brother and sisters with the attention spans of gnats, this one is for you. Pimp and preen, substitute and ignore. Live life dangerously, and enjoy every morsel. Water or stock start with maybe 1/2 a litre and add more when blending if needed. 1 potato chopped. This is to thicken the soup naturally, so if you plan to feed more people, add more. 1 onion or small leek chopped. Garlic as much as you want. 1 or 2 largish bunches of watercress thick stems removed. Pine nuts maybe a man size handful. Toast first in dry frying pan to add more flavour. Coconut milk or cream perhaps 2 tablespoons, to make it extra yummy. Cook the potato, onion and garlic in the water or stock until potato is cooked. Add watercress, put on lid and turn off heat. after a minute or so, stir watercress. When all has wilted, blitz with a blender. Add pine nuts and cream, blitz again. 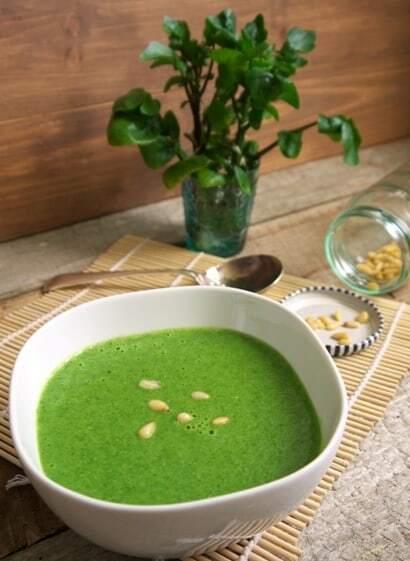 I would never have thought to make a soup out of watercress and pine nuts. Looks delicious! LOVELY recipe and photos, and another VEGGIE recipe, are you and Johnny turning to the green side Janie? LOL! SUPER stuff though, and I adore watercress too! I’ve barely ever followed a recipe in my life – I think I’m incapable. It’s called being creative ;-) Your soup looks just perfect – so green and fresh and spring like. We used to have watercress growing down on our plot, but it annoyingly died in the cold winter a couple of years ago. We used to have a lot of watercress soups. I’ve never added nuts to soup, other than having them as a bit of decoration, so must try one day. Kris, your message has made my day :) Thank you for taking the time to comment and I hope you enjoy your little bowl of sunshine! So pretty isn’t it Tammy? I love ‘a splash of this’ and ‘a dash of that’ recipes! They almost have to be my favourite way of cooking. That looks very good, so much green has to be good for you! Guess what I have lots of on my kitchen table J? It looks so good. Such a vibrant colour an anyway who cares about quantities when it comes to soup? Just chuck it all in, season it and it’ll taste wonderful. You’ve given us what we need to make it and what a fabulous pairing. oh this is gorgeous. I love the colours and the nut topping is such a great idea. Pretty pics too. So bright! I could make this in my Vitamix in a jiffy. I have never cooked or eaten water cress, being a vegetarian I guess tgats shameful so watercress is on my shopping list now so I can try this awesome soup. Aww, that’s brilliant! That is one of the best things about reading food blogs, is opening us up to new tastes and foods. My shopping basket is so much more varied now than before I blogged! I hope you love watercress, it’s a wonderful little plant! My kind of recipe, love it. I belong to your recipe following camp, even way before the days of food blogging I couldn’t help but add all my own variations on ingredients and quantities! Other than the odd cake I can’t think when I last followed a recipe to the letter, so yep I have the perfect blog writing job too. I have a very dear friend who also belongs to this camp BUT I’m always suggesting she might try at belonging to the former – absolutely each and every dish she cooks is nigh on disaster, her substitutions are just too wild, and the finished food is absolutely incomparable to what it should have been!! Does give me good cause to chuckle though, and she knows it!. Great watercress soup recipe btw. Oh do it! I made a broccoli & almond soup many moons ago, utterly delish! I know I’m a bit late commenting here, but I’ve just found your blog (love it!) and I’ve been scrolling back through the posts. I read this one thinking, “Sounds nice… I could use nasturtium leaves instead of watercress, and maybe a dollop of mascarpone cheese instead of cream.” I think you can guess which camp I fall into regarding recipes! 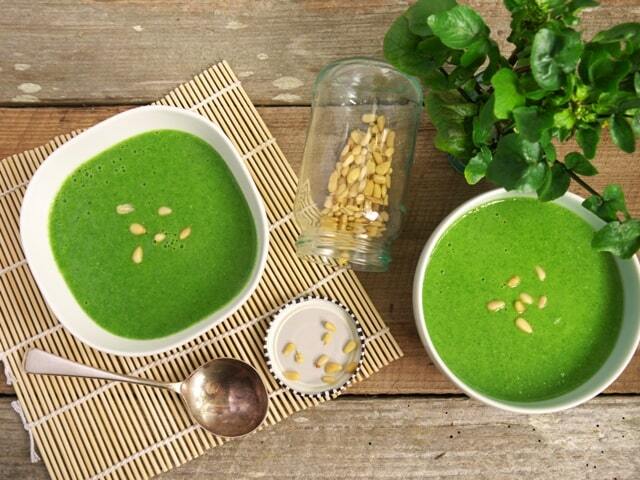 Love the colour of this soup – can’t wait for watercress season!